Sessions was a well-known critic of cannabis. Once, he even said that cannabis is “only slightly less awful” than heroin. But his opinions were out of touch with the American public. 62% of Americans believe cannabis should be legal, according to Pew Research. Clearly, the US electorate is pro cannabis legalization. And having Sessions as acting attorney general was a major source of uncertainty for US cannabis companies. 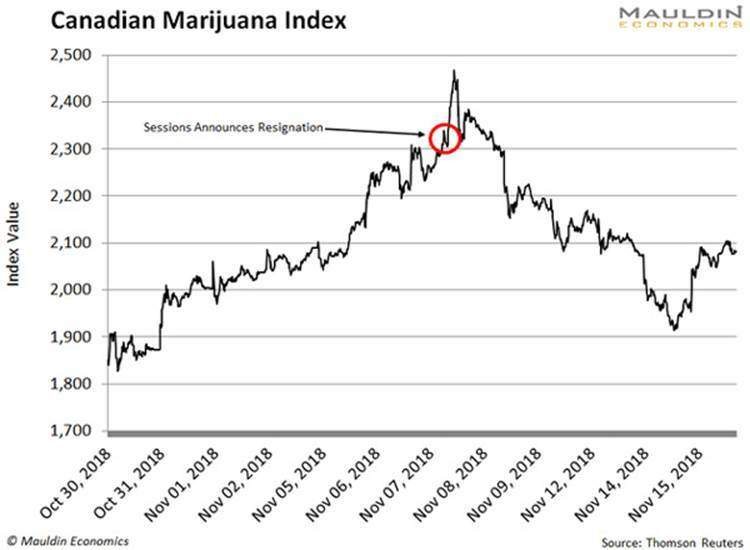 The cannabis market cheered Sessions’ resignation. In fact, the Canadian Marijuana Index jumped 7.1% on the news. Canada enacted full legalization last month. Now with Sessions gone, it won’t be long before we hear talk of legalization in the US. There are a couple of ways to invest in cannabis stocks. You can go the high-risk route and buy individual cannabis companies. If you do that, be prepared for extremely high levels of volatility. In my free investment newsletter, The Weekly Profit, I found a low-risk backdoor into the cannabis market. There are well-known, big-brand companies that have partnered with smaller cannabis companies that specialize in cannabidiol, or CBD. Most cannabis investors are betting on companies investing in tetrahydrocannabinol, also known as THC. But the safest opportunity is in companies that focus on non-psychoactive CBD. It is derived from the same cannabis plant. The non-intoxicating extract can treat many ailments. These range from epileptic seizures to ADHD, anxiety, insomnia, and inflammation. CBD is legal or has special laws that regulate its sale in 47 states. And the market is still in its infancy. In 2017, the CBD market was valued at $200 million. By 2020, market research firm Statista expects this market to be worth $2 billion. The market is forecast to be worth $20 billion in 10 years. The outlook for CBD is bullish. But I wanted to get an expert opinion before recommending it to my readers. I was in Medellin, Colombia on a fact-finding mission at the time. And I happened to have a contact at one of the country’s largest legal cannabis companies in my Rolodex. That’s a quote from the chief operating officer of one of Colombia’s largest private cannabis companies. Let’s call him Michael. During our meeting we covered every angle of the cannabis market. But Michael was really excited about CBD. Because THC has only one use: getting high. Meanwhile, CBD has many uses. One that’s often overlooked is enhancing mental focus and reducing inflammation. In fact, Michael noted the World Anti-Doping Agency recently removed CBD from its banned substance list. They did this because it truly helps athletes recover faster. The beverage market is in the best position to leverage this. You could make a CBD-infused beer, or a CBD athletic drink. Think of it as the marriage of 5-Hour Energy and Gatorade. And major companies in this industry are doing just that. At the moment, there are three major beverage companies exploring CBD-infused beverages. The first is Molson Coors Brewing Co. (TAP). News broke in August that the company would partner with Hexo Corp. to develop a CBD-infused beverage for the Canadian market. According to Molson CEO Mark Hunter, the Canadian cannabis beverage market is worth $2.5 billion. But they aren’t the only ones taking an interest in this growing market. Corona brewer Constellation Brands, Inc. (STZ) announced a $3.8-billion investment in Canopy Growth, the world’s largest cannabis company. The investment is intended to fuel growth in the edibles market, which includes investments in CBD-based beverages. Clearly, the beverage industry has taken note of the CBD market in a big way. Unlike cannabis-only companies, these beverage companies are not beholden to one volatile market. That said, they have the size and scale to roll out the first mainstream cannabis product. So if you want a low-risk backdoor into the legal cannabis market, the beverage industry is the clear avenue for you.